HOOI CHOO TAN takes us for a personal wandering into his own musings about being Malaysian. These are but a few of the common ‘first thoughts’ or stereotypes of Malaysia from many of our foreign counterparts. Unfortunately, it is true that some people still think that we live on trees and what is even more unfortunate is the MH370 incident that had the world focusing its attention on our disaster-stricken nation. But we are more than that. The true Malaysia is more than just the stereotypes, and more than what is shown in the newspapers, media or even our infamous ‘Cuti-Cuti Malaysia’ tourism advertisement. 10 years ago, if one were to ask a Malaysian, “So, what makes Malaysia so unique?” They would probably answer, “Oh, we are a multi-ethnic, multi-cultural society.” That is very true, still to this day but it is not what makes us unique anymore. In this time and age of globalization, increased mobility and migration has resulted in multi-cultural societies mushrooming all over the world. Although we are distinctively made up of Chinese, Indian, Malay and other ethnic minorities, being multi-cultural is no longer that ‘special thing’ that makes Malaysia, Malaysia. Our identity, is however the result of the amalgamation of all these cultures over the past 56 years of Independence, along with a dash of influence from our colonial rulers and international popular culture. Being multi-cultural is one thing, but having these cultures amalgamated to form a new culture, is another. I personally like to call it, ‘The Amalga-Malaysian’. Take for example the profile of a typical Malaysian. Malaysians are unique in many ways – most notably in the way that we speak. The majority of us are multi-lingual and we are probably one of the only nations in the world to mix up 4 languages in a single sentence. As a result of the cultural and linguistic fusion, we Malaysians have developed our own style of speaking – such that we sometimes puzzle Westerners with our English and leave many Chinese tourists dumbfounded with our style of spoken Mandarin. Hence, the birth of a new language called ‘Manglish’ or Malaysian English. Not only do we have our own style of speaking, but we have also established a distinct way of swearing – almost every Malaysian possesses a wide range of ‘vulgarity vocabulary’. Cantonese, English, Hainanese, Hakka, Hokkien, Malay, Mandarin, Tamil, Teochew – you name it, we know it. Bottom line is, do not attempt to swear at a Malaysian, because more often than not you will not understand 97% of the comebacks. The Malaysian identity is not something that can be easily put into words, but is something that every Malaysian can feel. It is what makes us the ‘same-same but different’ – because we all share the same identity, though we may be of different ethnicity or religion. Nonetheless, ethnicity usually only determines our way of life, our family upbringing and our first language. At the end of the day, what unites us all is the pride of being a Malaysian. Among the list of our world-renowned Malaysian cuisine is a dish called rojak. The concept of this hawker delicacy is similar to that of salads, and rojak literally means mixture in Malay. The common ingredients include pineapples, fried Chinese dough sticks, bean sprouts, fried bean curd, jicama and cucumbers, though it varies among rojak stalls throughout the country. However, what makes a rojak dish great, or in other words, the ‘make-or-break’ factor of a rojak dish, lies in the layer of its sauce or dressing. If every rojak ingredient were to represent a Malaysian, and the mixture of ingredients were to represent the Malaysian society, then the ‘Malaysian Identity’ that binds and unites us all is none other than the rojak sauce. Just like the ingredients, every one of us are different in our own ways, but coated with a layer of rojak sauce – and that is what makes us great. While the rojak sauce is the best representation of the ‘Malaysian Identity’, the best place where one can truly witness the Malaysian spirit is in any of our mamak stalls. 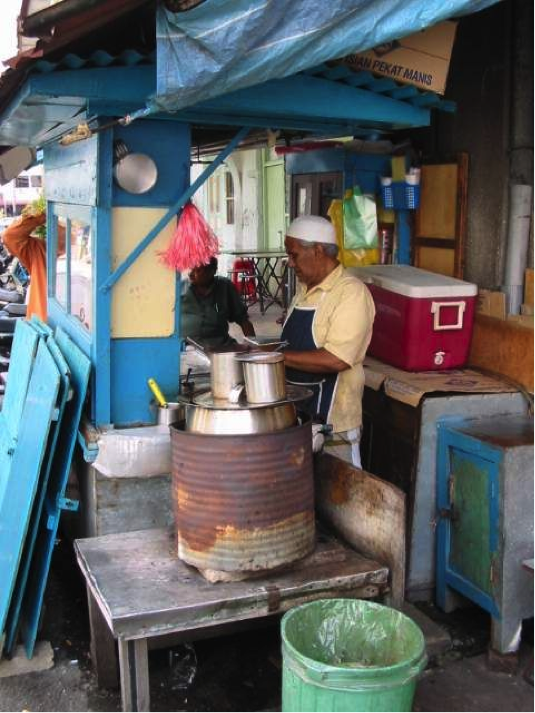 Mamak stalls can be found on every street corner. They are stalls or shops that generally operate 24 hours a day and are run by Indian Muslims. Their popularity has cultivated a culture of Malaysians gathering for supper at mamak stalls, which is also known as mamak culture. Regardless of a person’s ethnicity, religion, financial standing, educational qualification or status in society – there is almost no Malaysian that has never eaten at mamak stall. They are the ideal place for almost everything and any occasion, including breakfast, lunch, dinner, supper, gatherings, meetings, chill-outs or watching soccer. Imagine yourself sitting at a roadside mamak stall. You are immersed in the chattering of a variety of languages, and seated among a diversity of ethnic groups. You see families; you see groups of friends hanging out; you see soccer fans cheering. If you feel something moving about your feet, do not fret – it is probably just one of the stray cats popping by to say hi. This is a place where you see people with all sorts of differences coexisting in harmony. A place that is not perfect, but celebrates diversity. A place that is heartwarming, welcoming and one-of-a-kind. And this, is the true Malaysia.